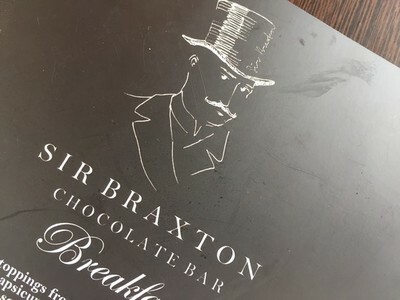 Sir Braxton, of Sir Braxton Chocolate Bar. 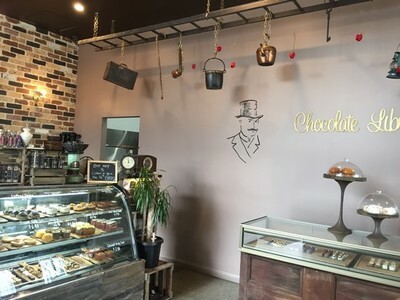 A captivating Edwardian man, complete with a curled handlebar moustache and top hat welcomes you to Sir Braxton Chocolate Bar, where potted plants line the walls and copper tea pots, old trunks (luggage, not shorts) and rusty pails hang suspended off the rungs of a decaying ladder. 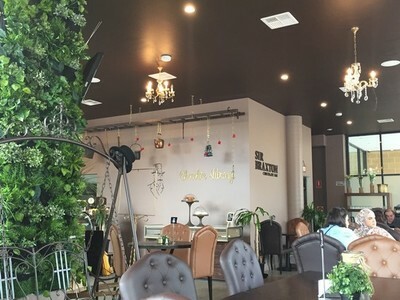 Giant bird cages, a wrought iron chair swing and gleaming chandeliers complete the Mad Hatter's Tea Party-esque vibe of the dessert bar that is tucked away on the back streets of Rockdale in Sydney's South. According to the enthusiastic waitstaff, owner Zena Fakreddine fell in love with Belgium while honeymooning in Europe. There she met her muse, the intriguing Sir Braxton, who encouraged her fulfil her dreams of opening her own dessert bar. 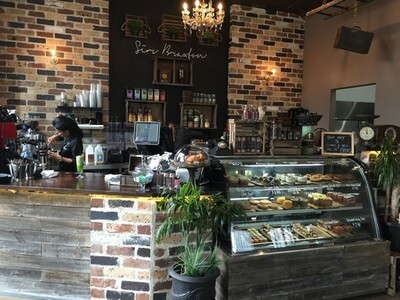 As an ode to inspiration, the dessert bar became Sir Braxton's namesake and the chocolate, coffee and even the trinkets lining the walls were all imported from Belgium. While the story surely leans on the side of hyperbole, it fits well with the whimsy of the dessert bar, so I'll let it slide. Besides a four page menu, there is also a cabinet stuffed with tasty treats. Despite being a chocolate bar, Sir Braxton's menu comprises much more than just sucrose laden delights. Open from 7am till 10pm daily, Sir Braxton serves up all day breakfast as well as lunch from 11.30am. It's the desserts though, filled with sugar, spice and all things chocolate, that keep the revellers coming back. 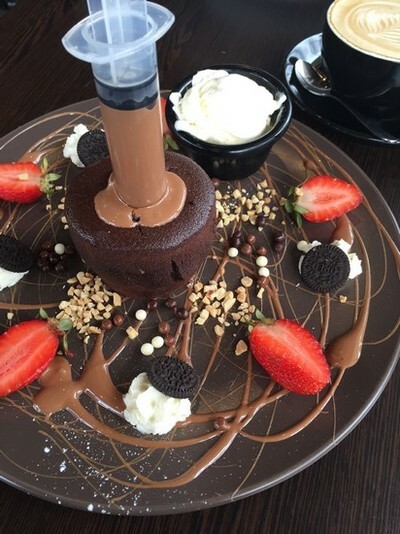 While Sir Braxton offers up the usual waffles, crêpes and cakes, it's their selection of slightly weird and wonderful desserts that really draw your attention. Chocolate pasta - not your usual dessert. 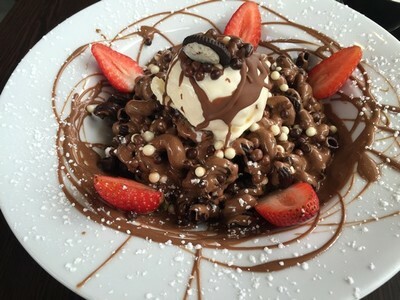 Take the chocolate nachos for example ($18); salty corn chips smothered in Belgian chocolate and served with bananas and strawberries and finished with an array of super sweet toppings. If the thought of Doritos and chocolate it freaking you out, go for the chocolate pasta ($18), which is exactly what it sounds like - spirals of tender chocolate pasta in a sauce of either white, milk or dark chocolate. A scoop of vanilla ice cream and fresh strawberries are the garnish on this pasta dish. If you just can't get enough, the chocolate addict ($18); a warm chocolate cake with a decadent gooey centre topped off with an extra shot (literally) of chocolate, is just for you The syringe, while lots of fun to play with and perfectly fitting the 'addict' theme, seems a tad redundant however as this rich, luscious cake is perfect without all the added sweetness - while most might disagree, there is such a thing as too much chocolate. If the prospect of all that chocolate is simply too overwhelming you can always opt for one of Sir Braxton's specialty drinks which include a green tea latte, a Snickers frappé, or simply, a rich and aromatic flat white or gourmet pot of tea. While prices do run high at Sir Braxton, the portions are generous - definitely enough to share (or you know, not) - and the quality of everything, from the ingredients used to presentation and service is all impeccable. Where: Shop 2, 13-19 Bryant Street, Rockdale, 2216. Cost: Breakfast from $10.90, Lunch from $18.90. Desserts from $5.50. When: Open every day from 7am till 10pm. Take away: Yes, certain things including drinks and ready-made cakes and chocolates are available to take away.